For any American who wants an answer sooner, there are just five words, among the thousands of suggestive texts Page and Strzok exchanged, that you should read. That passage was transmitted on May 19, 2017. 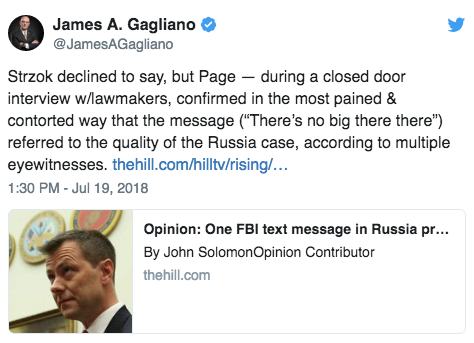 “There’s no big there there,” Strzok texted. By the time of the text and Mueller’s appointment, the FBI’s best counterintelligence agents had had plenty of time to dig. They knowingly used a dossier funded by Hillary Clinton’s campaign — which contained uncorroborated allegations — to persuade the Foreign Intelligence Surveillance Act (FISA) court to issue a warrant to monitor Trump campaign adviser Carter Page (no relation to Lisa Page). Lisa Page confirmed to lawmakers that the lead counter-intel agent on the Trump-Russia case, Peter Strzok, knew there was zero evidence of collusion between Trump’s camp and the Russians yet he pushed full steam ahead and unleashed the power of the premiere law enforcement agency onto a duly elected president anyway. It turns out that what Strzok and Lisa Page were really doing that day was debating whether they should stay with the FBI and try to rise through the ranks to the level of an assistant director (AD) or join Mueller’s special counsel team.